Oregon agric., farm values, products, acreages. Shell Highway Map of Oregon. 1 : 1238000 Hammond, C.S. 1 : 2550000 Johnson, A.J. 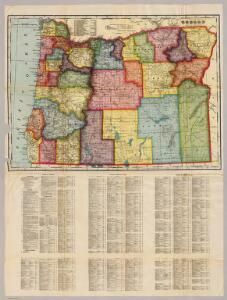 1 : 1457280 U.S. Folding Map Co.
Rand McNally Official 1925 Auto Trails Map Washington Oregon. Oregon, and the Territory of Washington. 1 : 3000000 Lloyd, H.H. 1 : 3000000 Walling, H. F.